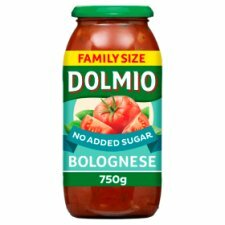 Tomato sauce with No Added Sugar. Brown 600g of mince for approx. 5 mins, until cooked through. Add your DOLMIO Bolognese sauce, bring to a simmer for 5-10 mins whilst gently stirring. Serve over spaghetti, or your favourite pasta and enjoy. We recommend 100g of dry pasta per person. Why not try adding your family's favourite veg, or even carrot or chili to spice things up?